YOU STAY IN THE SHOWER TOO LONG. Not only can staying in the shower too long dry out your skin, it’s also a tremendous waste of water. According to the Alliance for Water Efficiency, the average shower in America uses 17.2 gallons of water. Shorten your daily shower to 5 minutes, and you’ll save more than 2,000 gallons of water each year. YOU WASH YOUR HAIR LAST. Shampooing and conditioning your hair should be among the first steps you take when you get in the shower. Some of the residue from these hair products can remain on your face, skin, and hair even after rinsing, so it makes sense to follow hair washing with the rest of your shower routine. Using a gentle soap or cleanser on your body and face will help ensure you scrub away any remnants of your shampoo and conditioner. YOU GO TOO HOT OR TOO COLD. Finding the perfect medium when it comes to shower water temperature can be a challenge. We all know the luxurious feeling of a piping hot shower when the weather is chilly. And a nice cool shower can be so refreshing on a hot day. But it’s best for your skin to keep the temperature moderate, no matter what it feels like outdoors. The American Academy of Dermatology (AAD) recommends a warm, not hot, temperature to prevent skin from drying out. You can even adjust the temperature on the water heater itself to be sure your water physically can’t go above a certain temp. Water heating is also the second largest energy expense in the home (second to air heating and cooling)—so any reduction in temperature here will offer big savings on your monthly bill. YOU IGNORE YOUR POST-SHOWER ROUTINE. The AAD recommends blotting your skin gently with a towel to dry off post-shower, instead of rubbing your skin with the towel, which may cause irritation and itchiness. And always apply moisturizer within a few minutes of toweling off to help lock in moisture from the shower (just steer clear of the 6 most harmful ingredients in lotion). YOU DON’T VENTILATE YOUR BATHROOM PROPERLY. 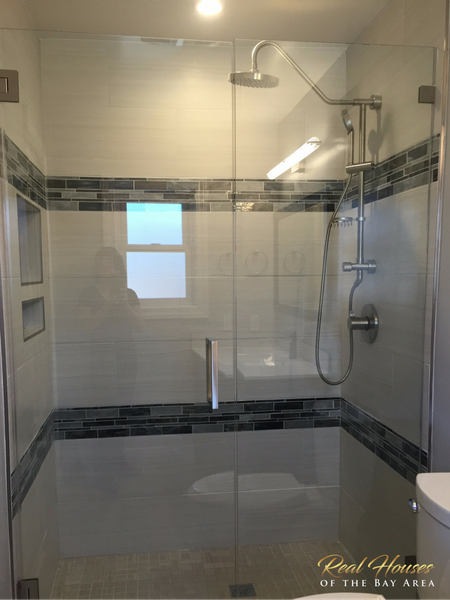 Mold develops and thrives in damp areas, so a nonventilated bathroom is its dream home. Even though not all residential building codes require it, installing an exhaust fan in your bathroom is a smart move. Keep the fan running for a few extra minutes post-shower, too, as water tends to remain on surfaces like shower walls, the floor, and the ceiling. YOU USE THE WRONG SHOWERHEAD. How old is your showerhead? If it was manufactured before the early ’90s, it could have a flow rate of 5.5 gallons per minute. Compare that to current showerheads on the market, which are required by federal regulations to have a flow rate of just 2.5 gallons per minute—or even less. If your home contains older fixtures, check to see if your showerhead needs an update. There are countless options available, but you can expect to invest a minimum of $10 for a decent one. Although it has become just part of the routine, showering has the potential to be not only an enjoyable and invigorating treat but also a revitalizing therapy. By simply alternating the faucets, you can boost your immune system, increase metabolism, enliven healthy circulation of blood and lymph and promote detoxification. The procedure is simple and easy to remember, just think three minutes, thirty seconds, three times. Three minutes hot, followed by thirty sec cold, repeated three times. Time it accordingly so the shower ends on cold. Start out with mild differences in temperature, working your way towards greater extremes at your own pace. You should never feel sick, uncomfortable, burning or pain during this treatment, if you begin to feel any of these, immediately return the water to a neutral temperate or end the shower and slowly sit down if needed. Hydrotherapy heals through the fundamental nature cure concept of balancing and moving the blood and lymph. It might be hard to see why such a basic concept could be so rewarding but the blood is responsible for approximately 1/13 to 1/12 of the total body weight and the lymph fluid is an amazingly approximately 1/4 to 1/3 of the total body weight. Purifying and moving the blood and lymph is essential to restoring or maintaining proper health and harmonious vibration of the body. As the blood flows in, it brings with it nutrients to nourish our vital tissues. Then, as it leaves it carries out toxic and inflammatory by-products to cleanse and detoxify. Ever wonder why you can tolerate 120°F sauna but not a 120°F hot-tub? Or why winter waters are so much more dangerous than winter air? Water has a profound ability to transfer heat and carries heat rapidly to and from the body over twenty-five times faster than air. Water has the ability to both absorb and expel large quantities of heat because it has a high specific heat. Its fluidity also allows it to contact all areas easily. Short hot, 98-104°F lasting less than five minutes, is intrinsically stimulative to the circulation. Short heat causes direct dilation of blood vessels. It increases the metabolism, oxygen absorption, carbon dioxide excretion and blood glucose levels while, decreasing tissue tone, red and white blood cell count. Short cold, 55-65°F for less than a minute, is reactively stimulative. It has an immediate, momentary and insignificant vasoconstrictive effect followed by a direct reactive vasodilatory effect. This vasodilatory effect increases skin and organ circulation, metabolism, detoxification, oxygen absorption, carbon dioxide excretion, and nitrogen absorption and excretion. It boosts immunity through increasing white blood cells and promotes nutrition through increasing red blood cells. Short cold also increases tissue tone, peripheral white blood cell count and decreases blood glucose. Cold is a greater difference from our normal body temperature, making it perceived as more of a threat and therefor reacted to faster than hot. On days when you can’t do the full treatment, try to still end with cold! When alternating hot and cold, each subsequent application is magnified by the application prior to it. The hot application magnifies the effects of the cold, the cold magnifies the effects of the hot and so on. Alternating applications acts a pump through the tissues, magnifying the movement of blood and lymph, maximizing the peripheral heart function, de-congesting and acting as an analgesic. The greater the temperature differences between the body, the water and the two alternating temperatures, the greater the treatment intensity. In other words, strive for temperature extremes but always do so within your own limits. We’re not going to tell you you’re showering wrong — when it comes to being naked, best practices are clearly a personal preference. But there is a way to shower optimally, for better looking skin and hair when you step out. And the trick is so simple, you can add it to your everyday routine. It goes like this: before you step out of the shower, douse your skin and hair in cold water for 2-5 minutes. The theory, according to GQ, is that the the steam from your boiling shower is bad for your skin and hair, and the heat and moisture actually dries out your skin. Cold water, on the other hand, can help seal the moisture in and improve blood flow, providing numerous benefits, but not the least of which is healthy-looking skin and hair. And there’s some truth to that, according to an interview GQ did with dermatologist Dr. Terrence Keaney. Cold temperature decreases transepidermal water loss, contributing to better skin hydration,Keaney told GQ. What this means is that it draws less moisture and essential oils away from the skin, keeping it where it belongs. Cold water also constricts blood vessels, decreasingthe look of redness and irritation on your skin. As for your hair, dermatologist Jessica Krant told the Huffington Post that cold water can affect the hair by decreasing inflammation around hair follicles, flatting them against the scalp, and making your hair look healthier and stronger. But cold water can also make you healthier. According to Keaney, it “redirects blood flow to deep blood vessels, improving blood flow to the heart” with the resulting effect of jump-starting your metabolism. Some studies have also suggested, according to Medical Daily, that cold water also increases heart rate, speeds up muscle recovery, and stimulates weight loss. For the more morning-adverse among us, it also provides a more immediate benefit: it wakes you up! To get these benefits, one must run cold water (no lower than 61 degrees Farenheit, since any lower may be dangerous) over you skin and hair for about 2-5 minutes. And there you have it: A better looking, healthier you and all it took was a little bit of suffering in the shower. I still remember the first day at work here at Pulse. A lot of things to learn about the company and how to develop a marketing strategy for the company, however the most important thing I had to learn was HOW TO INSTALL THE SHOWER. After few months working at Pulse I decided to take one of the showers home and install it myself. It is important to mention that I had ZERO experience with plumbing. My wife even asked me couple times if I was going to install my new Kauai III by myself. Well, I had to. In the end of the day I was working for a shower manufacturer. For my surprise, after 30 minutes I was done. My shower never looked that nice before. Next day at work I knew I had a big project to work. 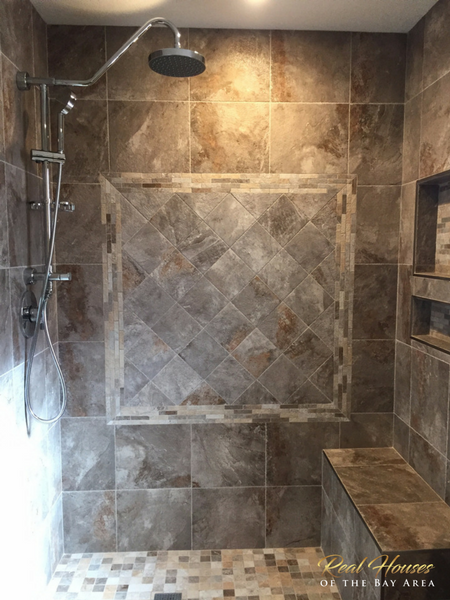 The project was: SHOW OUR CUSTOMERS HOW EASY IT IS TO INSTALL A PULSE SHOWERSPA. We made a decision to create a video and the result you can see below. Enjoy it and install your Pulse ShowerSpas today. I am sure you can. 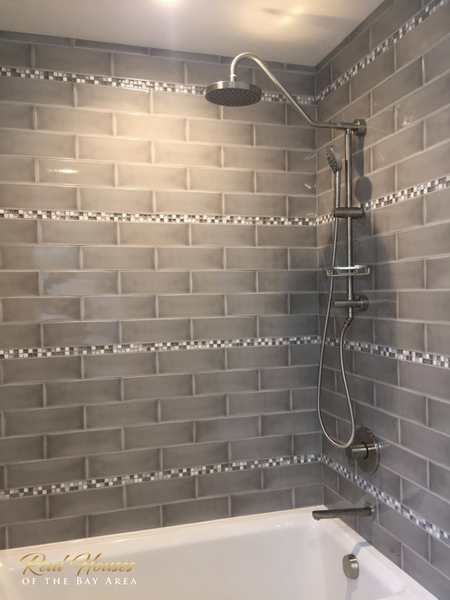 Bathrooms are one of the most used spaces in a home so your bathroom experience, in particular your shower experience, should be as amazing as your budget allows. Now let’s not get carried away. We don’t need a whole car wash experience, especially in California where we have the strictest water flow rate standards due to our drought situation. The rules apply to new builds (or remodels) and if you are doing work with permits, the Inspector will be checking the specifications for the fixtures you install to ensure compliance with the ever-changing rules. If you are retrofitting, it technically doesn’t apply to you but we should, of course, be as conscious of saving water as possible. Bathrooms are one of the most used spaces in a home so your bathroom experience, in particular your shower experience, should be as amazing as your budget allows. Now let’s not get carried away. We don’t need a whole car wash experience, especially in California where we have the strictest water flow rate standards due to our drought situation. The rules apply to new builds (or remodels) and if you are doing work with permits, the Inspector will be checking the specifications for the fixtures you install to ensure compliance with the ever-changing rules. If you are retrofitting, it technically doesn’t apply to you but we should, of course, be as conscious of saving water as possible. With that said, how many of you would enjoy a shower experience similar to these? Notice the rain shower head and the separate handheld unit? 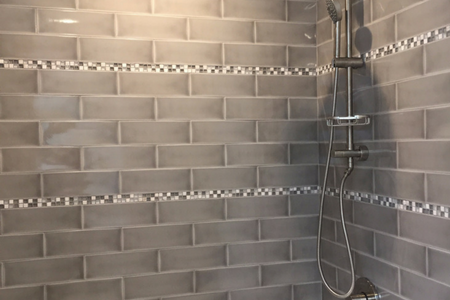 If you’ve not had the pleasure of using a rain shower head before, you are missing out. 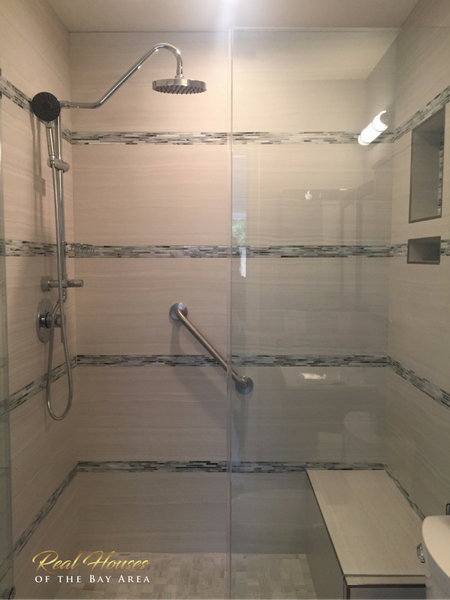 My first experience was at a spa in Hawaii and from that moment on, I knew that when I had the opportunity, I would install a rain shower head in my own personal shower and I did. Note that the rain shower is purely a luxury amenity. It’s a really nice finishing “experience” and is very relaxing. It is not utilitarian. That’s what the handheld shower unit is for. That is an absolute must. I absolutely hate hotel showers that only have the stationary shower head. How do you really get your body clean with a single stream of water, let alone cleaning the tub/shower? Not acceptable! My rant aside, having installed a rain shower head along with a handheld unit and having the multiple valve options to operate each unit independently and together, the price tag was well into the low 4 figures…not cheap! It was very nice but it was an investment for sure! Fast forward to just a few short years ago, I learned about Pulse Showerspas and I have been installing them in every bathroom renovation project since. For a very low investment (under $300), you get the rain shower head and the handheld with the bar. They come in various finishes including brushed nickel, chrome, and oil rubbed bronze. There are several styles such as the Kauai II and Kauai III which are the most contemporary and my personal favorite. There is also Aqua Rain which is little more traditional looking but still very clean lines and the Lanikai which has multi-functions (talk about major luxury!) Take a look at a few projects where we’ve installed this system. Again, I am partial to the Kauai II and III for it’s contemporary aesthetic. The best part is, you can retrofit your existing units. 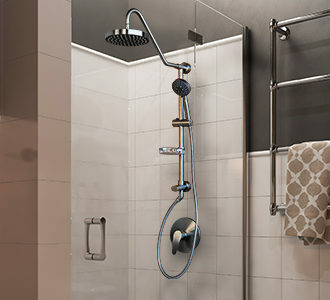 That means you can easily remove your existing shower head and install the Pulse Showerspa system of your choice. It’s really that easy. No major renovation required. Give it a try…I promise you will LOVE the results. Just read the reviews…overwhelming positive and you didn’t spend 10-15 times what it would have cost you for a traditional system. You’re welcome! ?